When it’s time to go shopping, it’s the perfect time for a generous shawl to wrap around your shoulders. Make it a special one that shows off the subtle gradations of colour in a handpainted yarn. Using a simple lace stitch pattern combined with Reverse Stockinette Stitch, this sumptuous stole is worked entirely on the diagonal, giving this piece its exquisite drape. 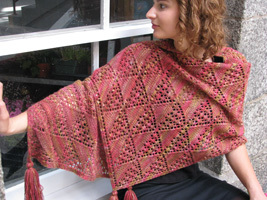 The stole pictured is knit with Fleece Artist Woolie Silk 3-Ply, 65% wool, 35% silk, (230 m./252 yds. per 100 g. skein), colour “Wine Country”.